After missing VK1RX/P2, Al on VK2/ ST – 042 this morning and, then not hearing VK3ANL/P2, Nick in Sydney at VKFF-473 on 20 metres, I finished up having a quick contact first with VK6MB, Mike and second with VK5PAS, Paul, on 20 metres on 14.285 MHz. This was the frequency where we should have heard Nick. But propagation did not favour our direction! Paul said he was going to have an early lunch at about 11:30 central time and would tuck into a bowl of ravioli. Not to be outdone, my wife Jenny and I decided we would visit our local and have lunch. I now don’t have to cook our dinner tonight! Anyway we collected our mail at the Stirling Post Office and my Shack Sloth certificate had arrived from the UK. I was pretty happy with that. Now for the next 1000 points! I qualified for the Shack Sloth award on Sunday afternoon after my contact with Rhett, VK3WE/3, who was portable in East Gippsland on VK3/VG 027, Mt Baldhead. 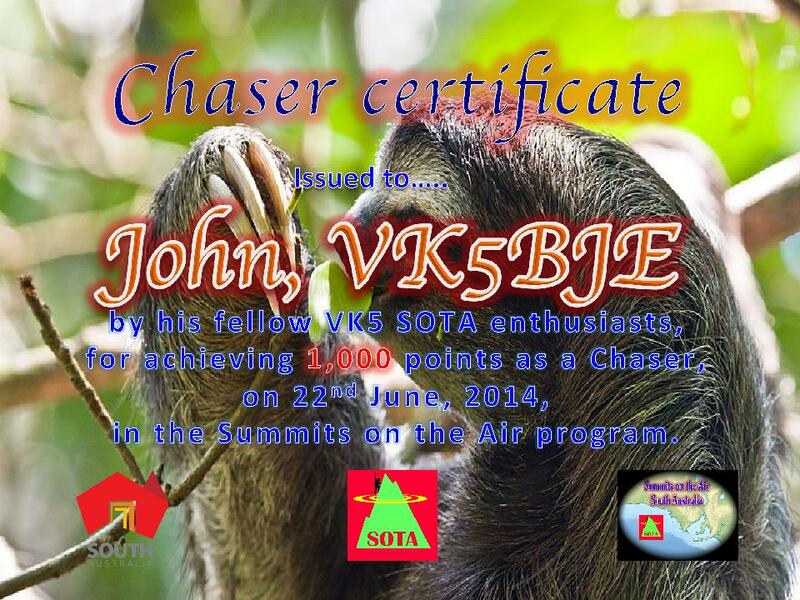 I began chasing SOTA operators in March 2013 contacting VK5NIG/P5, Nigel at Mt Crawford, or Mr Mount Crawford as he is called by VK5PAS, Paul, and 15 months later I reached my goal. It has been a great journey! All contacts have been on 40 and 20 metres and mainly SSB with an occasional CW contact as well. I want to improve my CW skills after a long lay off, especially sending in the first instance, with a hand key. Once again I am reminded of Dante’s Divine Comedy where the climbers are rewarded and the lazy ones…well? What is this all about? Well Dante (the author) and his companion Virgil are making their way through hell, purgatory and on to heaven. They are in purgatory. They are climbing a peak, yes it is pre-SOTA, and see a narrow gap! You know the feeling, it is cold but you are sweating, you keep wondering how far it is to go to the summit, you wish you had not packed so many batteries and had left a couple of antennas behind. You feel like you are in hell, but suddenly you think you see the summit, then another twist in the track (purgatory) and then finally the summit. (I am not referring to the easy summits which can be approached by car and a short walk). You can sit down and you think this is heaven! Now I can set up my radio, you think. You think you see a chaser sitting near a rock (or think of her/him in the shack) – ‘sloth’ you think, or as one translator says, ‘laziness’. But you, oh activators you know well, your efforts would be in vain but for the Chasers. Dante Alighieri wrote his famous trilogy, ‘The Divine Comedy’ in the 13th century. I am a fan and have four translations of this work, not written in Latin, but the vernacular language of Florence, the language we now call Italian. It is an epic poem and I commend it to you. My apologies to Dante for my radio-influenced existential interpretation! Thanks Paul for this splendid certificate. It adds a lot of colour to my blog. 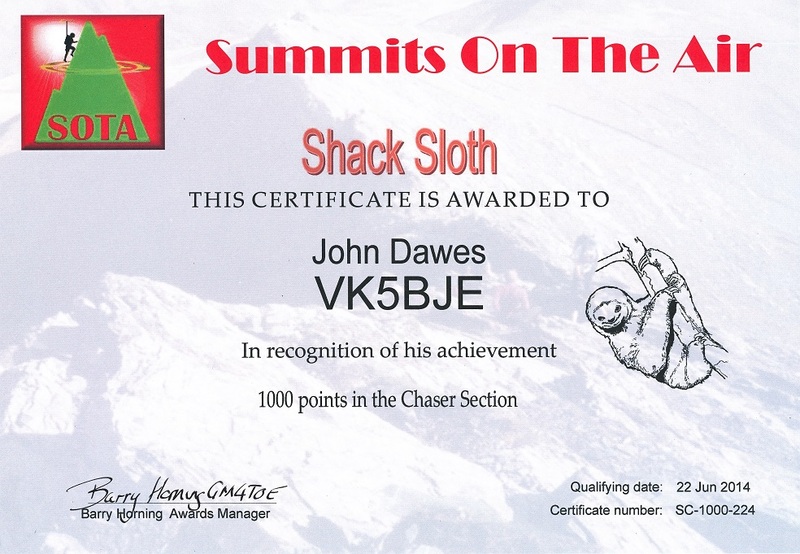 I will apply for the SOTA ‘Shack Sloth’ Certificate and Trophy as well and I am very pleased to join this small South Australian group.